Update 8/15: The graph shows the most popular torrents per state, relative to the national average—which is not the same as "most popular," as TorrentFreak explains here. Original article: In the last 40 days, over a million people in the United States have torrented or pirated something—including, yes, games. In an effort to understand how torrenting plays out across the country, we collected data about the location of seeding nodes for the top 300 most popular torrents, segmented across movies, television, and PC gaming. In all, our data set is comprised of almost 4 million nodes, 3 million unique IP addresses, and hundreds of copyrighted TV, game, and movie titles. A seeding node is essentially any computer that has downloaded a piece of content and is now a resource other computers can connect to to download that same content. The results are somewhat surprising, as you can see in the initial image in this post (you may need to click on "expand" to read the text in full). That Watch Dogs would be a popular torrent right now is to be expected—it's one of the biggest releases of the year. 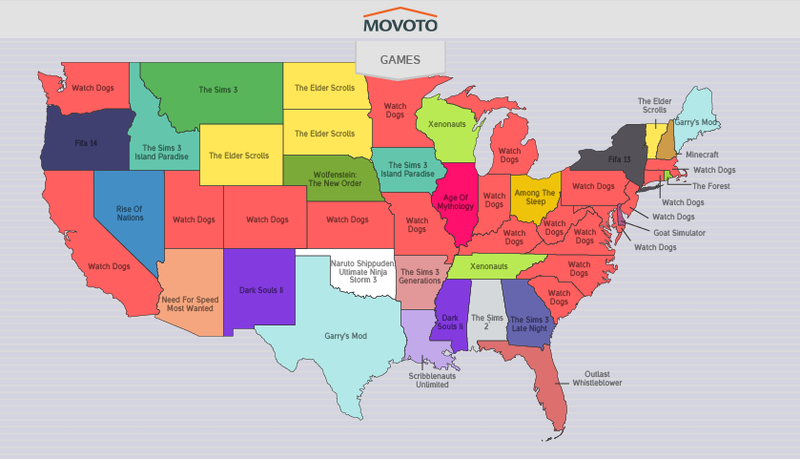 But who could have guessed that Oklahoma really loves pirating Naruto? And it's kind of a bummer to see smaller games like Among the Sleep make the cut, too. It's fascinating stuff. You can check out other popular torrents by state, including movies and TV shows, here.